Purchase online from Projekt, Amazon.com , the Machine in the Garden and other retailers. Submerse yourself in the third ethereal/darkwave foray from Mirabilis featuring Dru Allen and Summer Bowman, two of the genre's most-celebrated vocalists. As Mirabilis, these women go beyond the rock-hued sounds of their respective bands (This Ascension/Mercury's Antennae and the Machine in the Garden) to create beautiful, vocal-centered originals alongside reinterpreted pieces ranging from medieval to pop. As on their previous Projekt releases, 2004's Pleiades and 2008's Sub Rosa, Allen and Bowman weave their signature heavenly voices into a lush bed of dream-like harmonies amidst understated electronics, acoustic instruments, and majestic percussive elements. Their most diverse work to date, Here and the Hereafter transcend genres from cinematic, orchestral pieces to traditional folk and chant to spoken word. Accompanied by instruments including hammered dulcimer and recorder, these 16 tracks with roots as diverse as Bulgaria, India and Japan span ages and cultures, reality and dream. By design Mirabilis has always sought to invite other like-minded creators to contribute to albums and performances. The new album marks the band's first composition with long-time inspiration Monica Richards (Faith and the Muse) — whose vocals appear on the piece "Here and Hereafter" — and introduces neoclassical/baroque vocalist and harpsichordist Lacy Rose at the helm for "Can She Excuse My Wrongs." 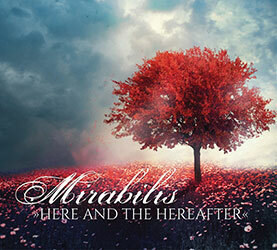 Mirabilis also renews its collaboration with Pete Murray (Lo-Pro, Life on Planet 9), who along with mixing the album contributes programming on a number of tracks. Two remixes conclude Here and the Hereafter: the first a sparkling rendition of "Sanctuary of Mind" courtesy of Justin Elswick (Sleepthief), the other by Bowman, which adds a steady beat to the haunting and originally sparse "Permafrost." The words "here and the hereafter" suggest that presence which resides in us now and our enduring and profound connection to the creative force of life. Here and the Hereafter embodies the search inward of one's own spirit and outward into the unknown. Though brimming with musical styles and instrumentations, ultimately it is the exquisite interplay between the two vocalists that serves as the driving force on Here and the Hereafter. The vocals serve not just as conveyer of lyrics but also as a distinct instrument unto itself. This is a spellbinding, affirming work that transports the listener on a sweeping, emotional journey.